The National Minimum Wage (NMW) first came into play in the UK on the 1st of April 1999 at £3.60 an hour. And now, 19 years later, the wage floor, which has been renamed the National Living Wage (NLW), is set to go up for the 19th time—to £7.83 an hour. 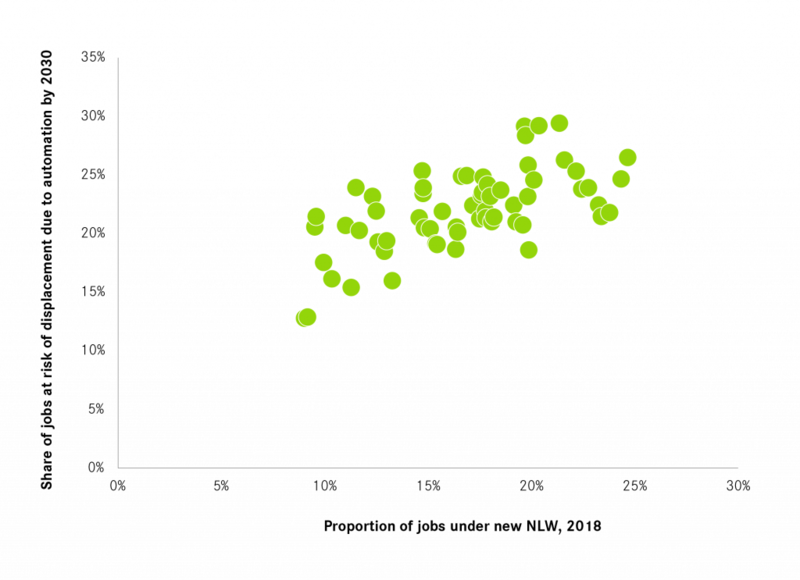 The average increase over the last four years has been 1.5 times the average increase over the preceding 15. Originally introduced by the Labour government under Blair, the policy was severely criticised by the opposition on the grounds that it could cause unemployment among low-wage workers and hurt small businesses. The policy has since come into favour across party lines and the present Conservative government has pledged to increase the figure to 60 per cent of the median wage by 2020 — to £8.57. At the outset, the rise in NLW benefits some of the UK’s lowest paid workers by boosting their take-home pay. A closer look reveals a slightly more complicated picture, especially when we consider how it interacts with broader economic trends within cities. Labour markets tend to be fairly local. Within the UK, the quantity and the quality of the workforce across different cities varies quite significantly and this is reflected in the level and distribution of earnings in these places. Consider Oxford and Cambridge, where a large proportion of the workforce is employed in skilled jobs in knowledge-intensive industries. Less than 10 per cent of the workforce in these cities currently earns less than £7.83 an hour. 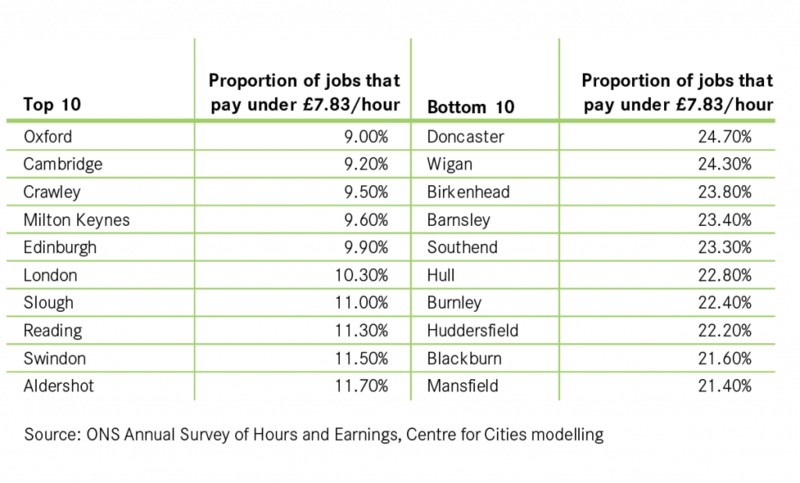 On the contrary, in Doncaster and Wigan, where much of the population is employed in low-skilled, elementary occupations in customer service and warehouse operations, nearly a quarter of workers earn less than the new NLW. 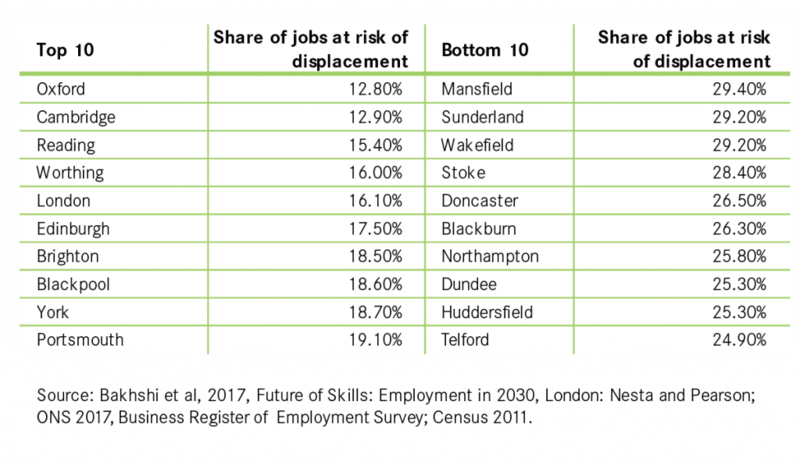 Perhaps unsurprisingly, there is a significant overlap between places with many low-paid jobs and places with a high proportion of jobs at risk due to automation. 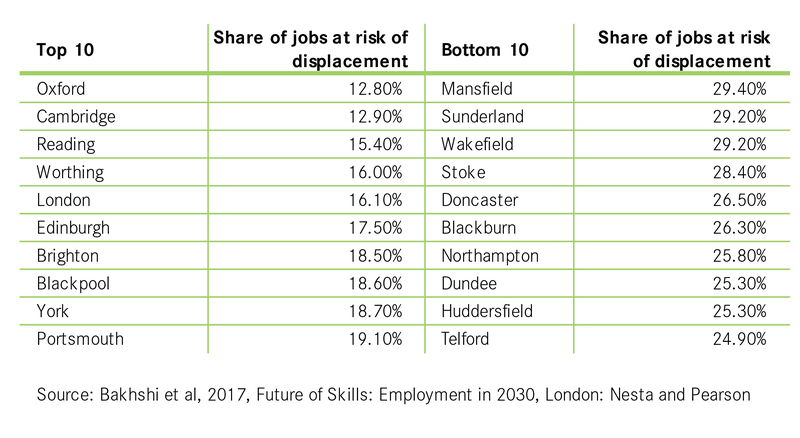 As highlighted in Cities Outlook 2018, the effects of globalisation and automation will be felt very differently across UK cities. Oxford and Cambridge come out on top yet again, with only 13 per cent of existing jobs expected to be displaced. In Mansfield, Sunderland and Wakefield, this tallies up to nearly a third of the workforce. In fact, looking at the estimates together — jobs that pay less than the new NLW and jobs that are at risk of being displaced — there are clear links between the two. Jobs that are low-paid on average tend to require a lower level of skills or are routine in nature, and hence are more likely to be lost to automation. In light of this, it is worth noting that edging the living wage higher, while well-meaning, could end up hurting those it is intended to help. Making labour more expensive is likely to prompt businesses to reconsider whether they are better off hiring one more employee or investing in technology that would do the job instead, thus expediting automation. The overall effects of this were the subject of a recent IFS report. While this shift may create jobs, in the long run, these new jobs will require different skills sets and are likely to be in different places. It is imperative that the local effects of national policies like the living wage are seriously considered and managed. There is a need for greater awareness on how increasing the NLW will affect the future of work, across the whole country. For now, the effects of the incoming NLW should be closely monitored, all available information should be considered and the integral advisory role of the Low Pay Commission should be retained before any future policy promises are made. 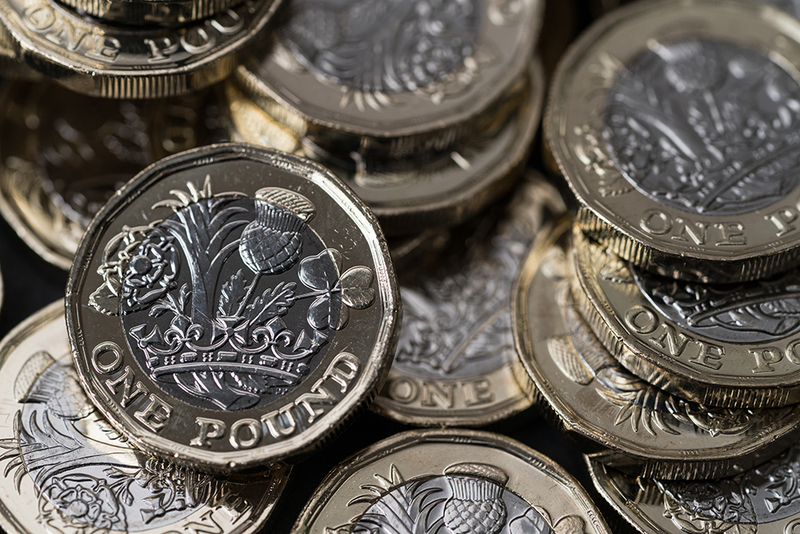 It may, in light of the evidence, be worth considering whether a blanket ‘National’ Living Wage remains an appropriate instrument or whether it has become a blunt tool. While they’re useful, wage policies on their own do not address the root causes of low wages. Cities need to focus on equipping those persistently on low wages with the skills and networks needed to adapt to the changing world of work.